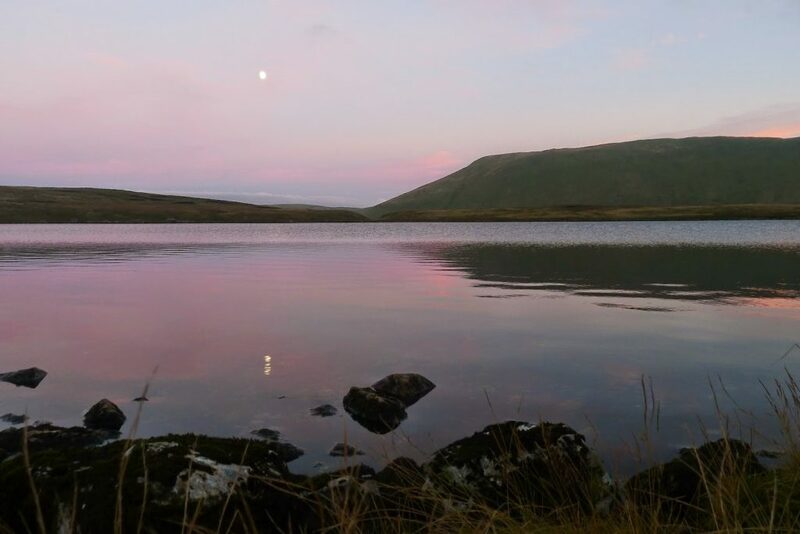 As ever, I didn’t manage to get away from London as early as expected so it was 6pm when I arrived in Bala to grab some provisions, parking at the lake to sort out my gear and load my rucksack. I had some new stuff to try out. I’d be using only the outer of the my Hex Peak shelter as a tarp and combining it with my new Borah Gear side-zip bivy to protect my sleeping bag. I was bringing along a new SJ4000 video camera – a Go-Pro clone, but at a quarter of the price. And as I only had one dehydrated meal left (and they get quite expensive if you are buying them regular) I’d be trying out a new supermarket food option. Parking in Llanuwchllyn it was a quiet hazy evening as I took the obvious path that gains the start of the Aran Ridge. Looking back I could see the Arenigs to the north-east, Rhobell Fawr to the west and the main ridge directly in front. Despite my pack feeling deceptively light I was finding it a bit of a struggle – the 5 hours in the car and little to eat taking it toll. I stopped at Moel Frenig to check my altimeter and estimated it would be another hour or so to my planned camp by Llyn Pen-Aran, near the summit of Aran Benllyn. Ahead there appeared to be a serious ascent but as ever fore-shortening made it look much worse. 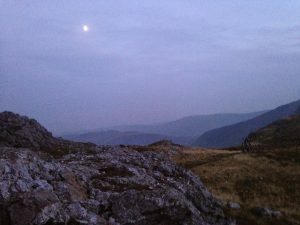 However my ascent was taking longer than anticipated and it was not long before the setting sun gave up trying to break through the haze, replaced by an almost full moon from the east, rising eerily through the mist. I struggled on walking off the sudden onset of cramp seizing my left calf. I passed a few small pools that I guessed weren’t my destination and a few minutes on I climbed over a stile to find a rather small Llyn Pen-Aran nestled in the gloom. I needed my headlamp to find a suitable campspot and quickly settled in for a still but damp evening. Unpacking my new Borah Gear bivy I was treated to the unmistakable crackle of cuben fabric. I’d opted for a cuben base and an argon upper, the latter being incredibly thin, making a lightweight package that packs incredibly small. Of late I’ve been using an old Adventure Medical emergency blanket to use as a groundsheet – it’s thin, tough and the silver side helps with heat retention, though it doesn’t offer too much protection from rocks and stones. I wasn’t sure whether I should use my NeoAir mattress inside or outside of the bivy bag – is there a difference? I decided to place the mat inside the bag, primarily to see whether it still left room for my bag to loft. 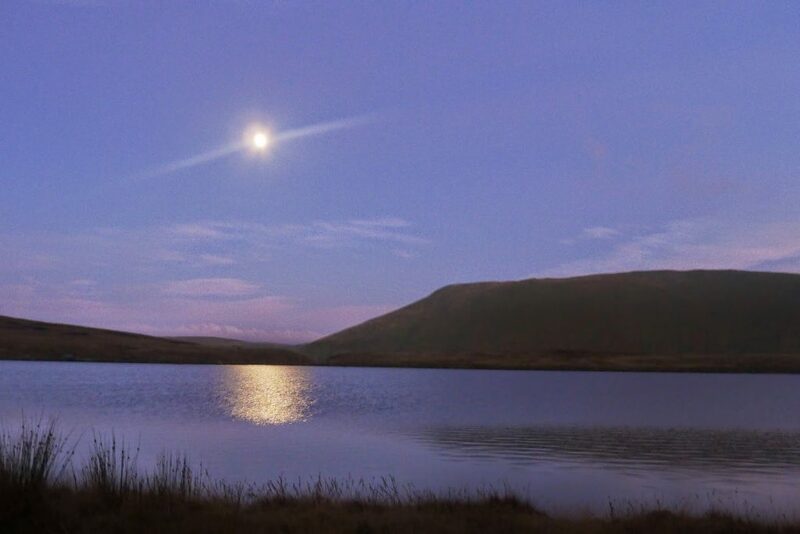 The air was still and damp and it was not long before condensation made everything glisten in the moonlight. It was 9pm as I cooked dinner and then snuggled down for the evening, the tent inner quickly soaked from condensation. With no bugs I decided not to worry about zipping up the mesh hood and soon drifted off to sleep in the silence. I woke in the morning to find I’d slipped down the tent and my feet had been brushing the wet inner. Consequently there was a wet patch on the foot of the bivy and some dampness on my sleeping back beneath, but no apparent condensation from within the bag. I opened the tent door to a white-out – I could barely see the water 10 metres away. I packed and set-off with regular bearing checks to make sure I didn’t stray from the ridge path, passing the summit of Aran Benllyn and then dropping across boggy ground before a short steep pull up to Aran Fawddvy summit. Low cloud still obscured the view as I set off south-west in the direction of Llyn y Fign at the south end of the ridge. Dropping into the slight col before Glasgwym the cloud lifted for a brief moment and I saw another four walkers popping out of the mist. Crossing an intersection of paths I started the steep trudge up to Glasgwym, spending a few minutes getting my bearings before eventually spotting the summit cairn and Lyyn y Fign just beyond. I lunched by the cairn as the lake came in and out of view with the drifting cloud. The mist thickened again as I set-off so I resorted to using the compass and pacing for the next 1.5km. It’s always quite satisfying to use basic hill-skills successfully and I was rather chuffed to pick up the fence line as planned above the cliffs of Craig Cywarch. 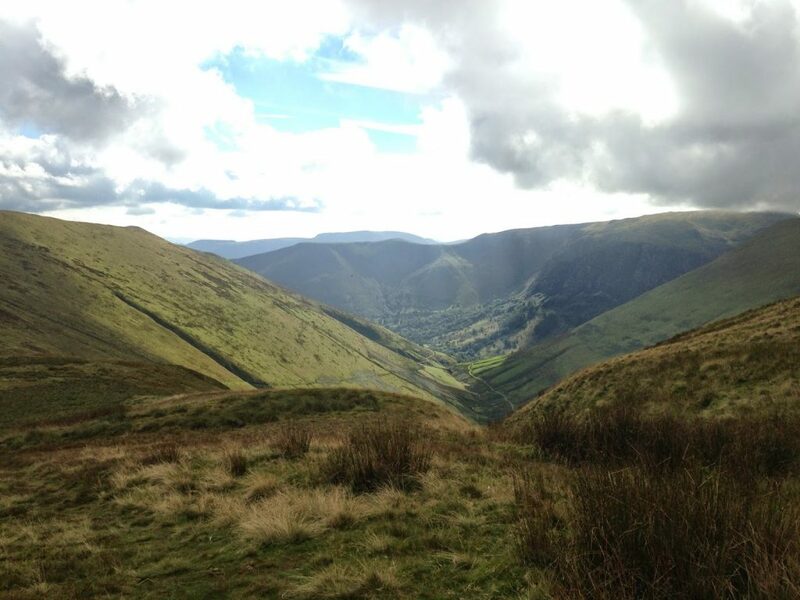 As I dropped height visibility improved until I could look down on a green and verdant Cwm Cywarch. An old miners path is the obvious decent and across the valley I could pick out the feint line of the path threading up Cwm Hengwm. My knees groaned at the prospect of having to drop 500m and then re-ascend the same to gain the ridge of Drysgol that spurs east from the main Aran ridge. The ascent was steady but relentless as I was treated to the first rays of sunshine on my back. On my left Cwm Cywarch opened up to reveal its contours, a few stream carving their way through vertiginous cliffs. The path peters out around 570 metres and the re-appears after a boggy section, turning north-west to head up to Drysgol. My destination was the waters of Creiglyn Dyfi. I knew from my last visit that if I ascended Drysgol I was only going to have to lose more height the other side. Or I could drop straight down to the infant river Llaethnant but would the need to reascend. I decided to stay at my current height and skirt around and under Drysgol, heading into the head of the valley and eventually round to Creiglyn Dyfi. The plan worked in that I maintained height but it was false economy as my route meant contouring a steep pathless terrain, adding extra distance and meaning an uncomfortable ankle-straining traverse. Arriving at the lake around 5pm I scouted round the western edge to gain the north-west corner where I’d heard there was a flatish spot to camp. Previously I’d pitched in the more exposed and damp south-eastern corner. The Hex Peak fly-sheet was still soaking from the night before but it quickly dried in the sunny breeze. The sun dropped lending a warming glow but it was to be a chilly evening with such a clear sky. With my shoes and socks soaking I put on my dry spare socks and found that Exped dry-bags made surprisingly effective waterproof slippers around camp. My supermarket food experiment consisted of a tomato and chilli pasta packet (£1) combined with a small tin of tuna (49p). My JetBoil Sol is designed for boiling water fast so simmering is not its forte. Stirring continuously to prevent pasta welding to the base of the pan I added the tuna near the end. It was a surprisingly tasty and filling meal for a quarter of the price of mainstream dehydrated meals. Mindful of the night before I positioned my sleeping mat and bivy further up the tent to stop my feet brushing against the inner and then rigged up a cord to keep the mesh hood of the bivy away from my face. I’d be fully tucked in tonight and went to sleep wearing socks and a top to supplement my Minim 300 sleeping bag. I wondered whether I’d feel too claustrophobic fully-enclosed within the bivy but it was fine and I woke early in the morning to find not a trace of condensation inside the bag. It was a much brighter day as I headed down into Cwm Llywdd, keeping left and meant a long traverse beneath Aran Benllyn and the main ridge until reaching Llyn Llibrawn, from where I could contour round to re-join the main ridge path, before dropping down to Llanuwchllyn and the car. I was interested to see how the cuben/argon combination worked. John at Borah Gear was very helpful in answering my questions and sorting my custom options of a part-mesh hood and an extra couple of inches width. Thanks also to Peter Dixon @munro277 for letting me call him to answer a few more questions before I decided on which options to go for. On arrival it weighed in at 136g and packs down impressively small. I was a little concerned about my choice of the argon upper after the damp getting through to my bag on the Friday night but I put that down to eight hours of brushing up against a soaking fly. 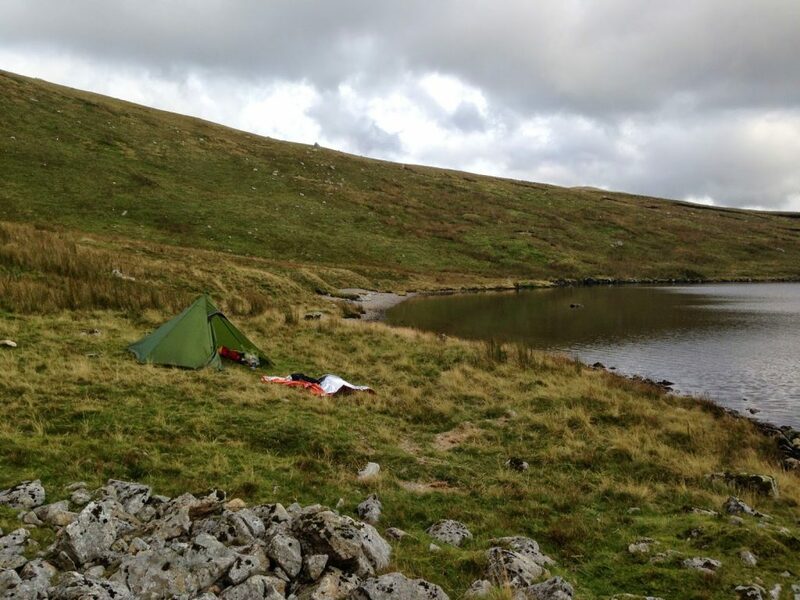 The second night when I was fully enclosed I had no condensation problems in the bivy. It certainly offers a new lightweight option – the Hex Peak outer + bivy saves around 400g over the inner. I had a little play with the SJ4000 camera but as it only arrived on the Friday morning I didn’t have time to fuly charge the battery or read any set-up instructions. I’ve since used sailing in Turkey and my gf even used it diving down to 25m. For £70 including waterproof housing and a myriad of mounts/brackets it’s not quite Go-Pro quality but not too far off. Thanks to @outdoorsmh and his TGO Challenge videos for the inspiration to try it out.. I rather enjoyed ‘making’ my own meal which was cheaper and tastier than some of the dehydrated meals I’ve tried. Though not as convenient as the pre-packaged dehydrated meals I found the preparation added to the feeling and satisfaction of self-sufficiency that is more in tune with wild-camping. Supermarket options going to be a bit of trial and error but I’ll be trying a more options next time. So in all, a much-needed weekend in the mountains and an often neglected corner of Snowdonia. It’s good to try out new gear options and even geting navigation in poor visibility. Even with such a short trip we can learn something and add to our experience and skills. Good looking trip that Nigel. Nice photos of Creiglyn Dyfi . Good to hear about the BG bivy. I have used mine 3 times now. Once on its own outside – not recommended. Schoolboy error dew will condense on the outermost layer, very wet inside the bivy before I even got in. The other 2 times inside a shelter, comfortable and dry. Cheers Mark. Lots more to explore in the area. Happy with the BG bivvy though may add additional DWR at the foot end in case I rub up against the fly again. 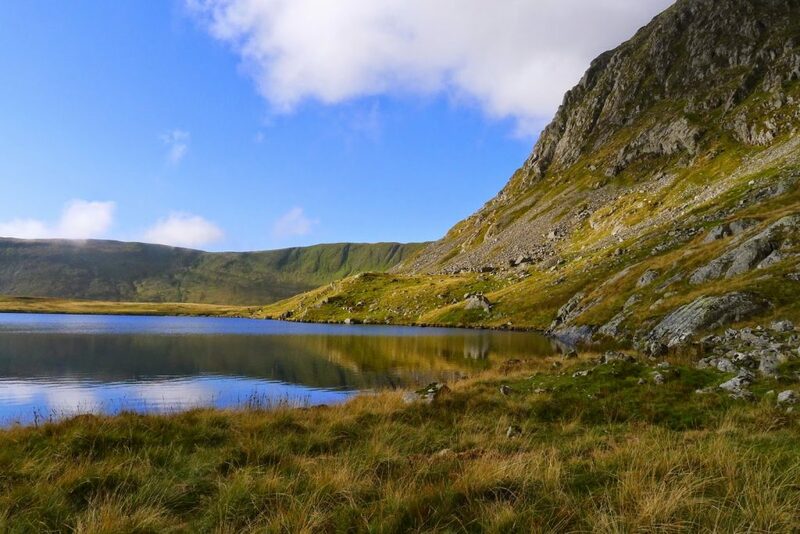 That's the route we have taken on several occasions, looks like the same spot as my pitch by Creiglyn Dyfi – superb stuff. Despite the slight awkwardness of that traverse, I really like the Llaethnant valley because of the solitude and scenery. 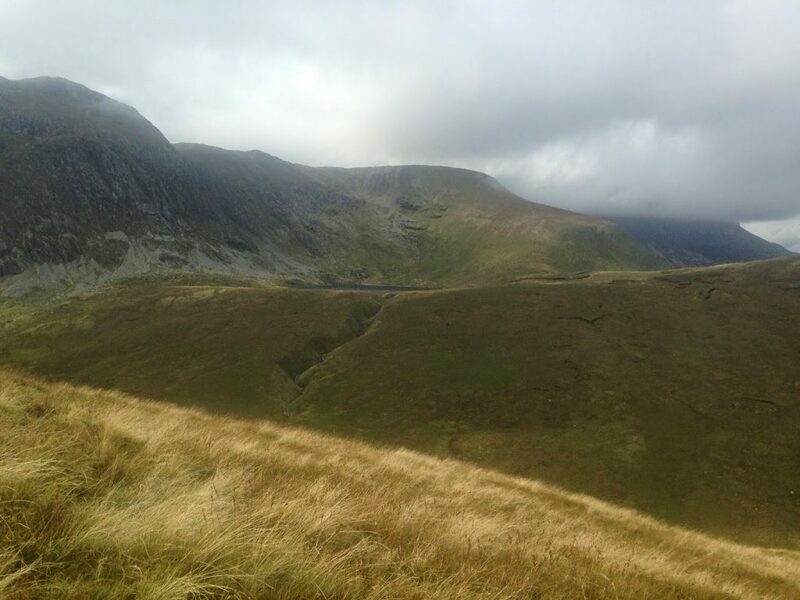 Hi Geoff, it's wild and unspoilt, without the crowds of northern Snowdonia. I only saw two other people all weekend – let's keep it ourselves!